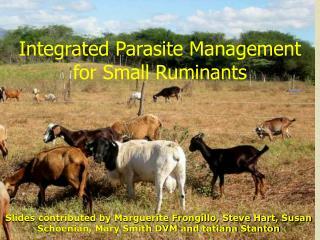 A Manual for Implementing Integrated W ater Management : The Economic Perspective. 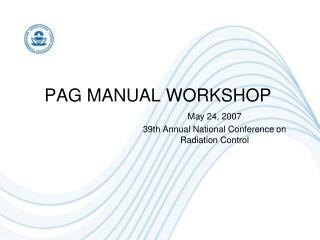 Step1_A. 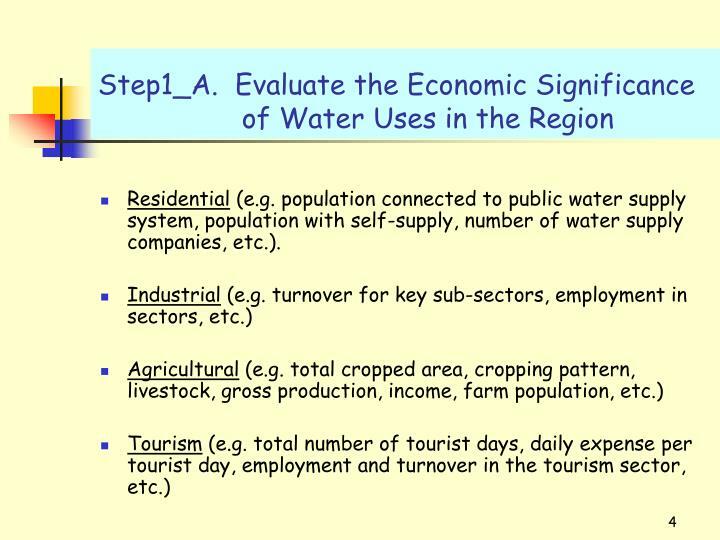 Evaluation of the economic significance of water inthe region. Step1_B. 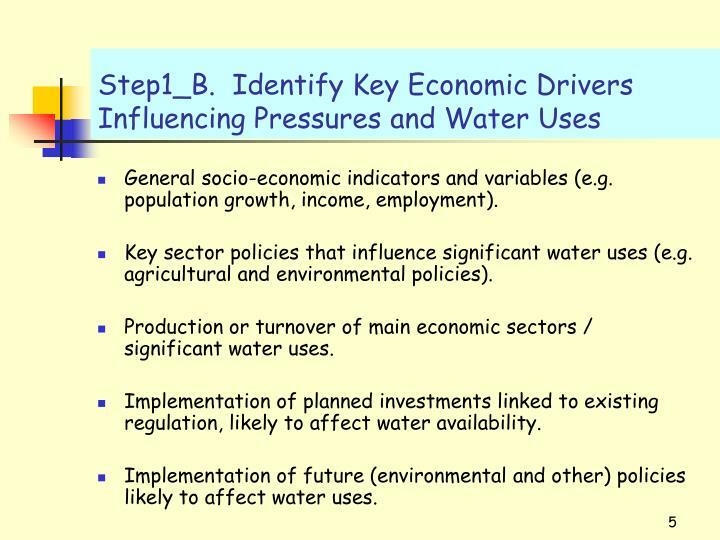 Identification of key economic drivers influencingpressuresand water uses. Step1_C. 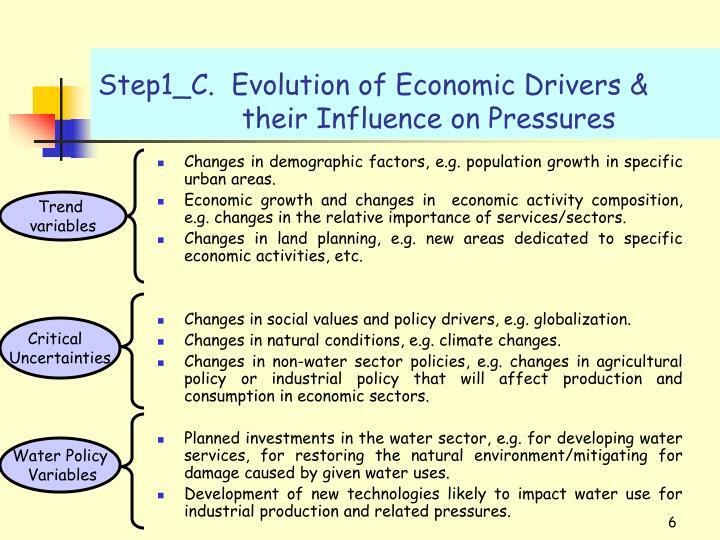 How will these economic drivers evolve over time & howwill they influence pressures? Step1_D. 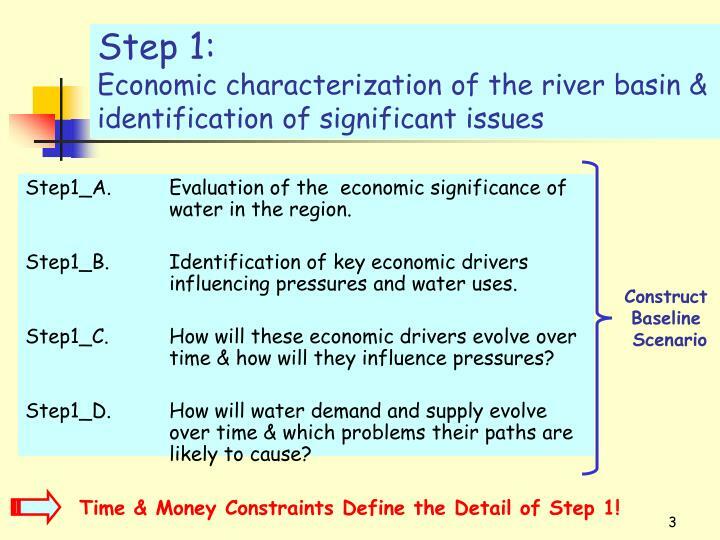 How will water demand and supply evolve over time & which problems their paths arelikely to cause? Time & Money Constraints Define the Detail of Step 1! Residential (e.g. population connected to public water supply system, population with self-supply, number of water supply companies, etc.). General socio-economic indicators and variables (e.g. population growth, income, employment). 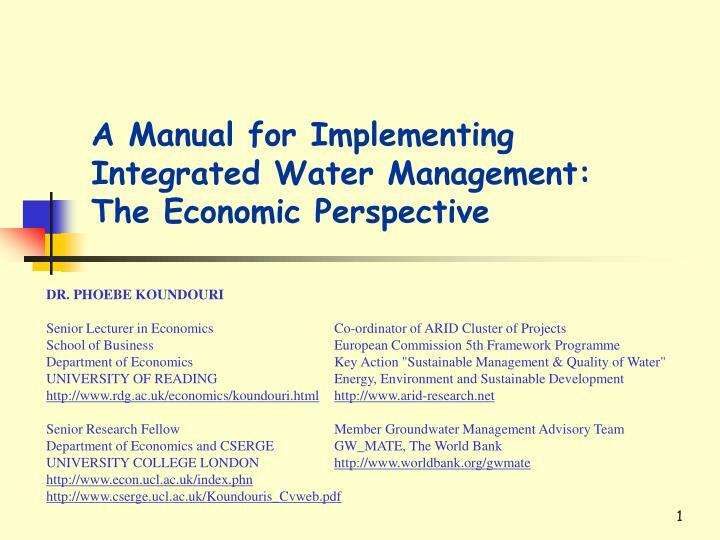 Key sector policies that influence significant water uses (e.g. 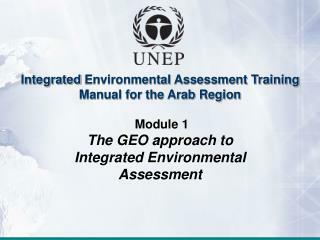 agricultural and environmental policies). Production or turnover of main economic sectors/ significant water uses. Implementation of planned investments linked to existing regulation, likely to affect water availability. 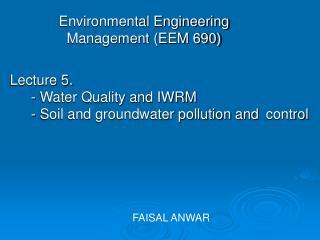 Implementation of future (environmental and other) policies likely to affect water uses. Changes in demographic factors, e.g. population growth in specific urban areas. Economic growth and changes in economic activity composition, e.g. changes in the relative importance of services/sectors. Changes in land planning, e.g. new areas dedicated to specific economic activities, etc. Changes in social values and policy drivers, e.g. globalization. Changes in natural conditions, e.g. climate changes. 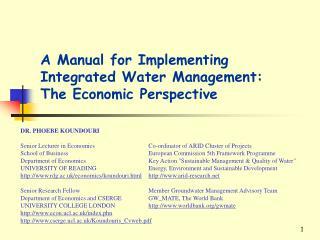 Changes in non-water sector policies, e.g. 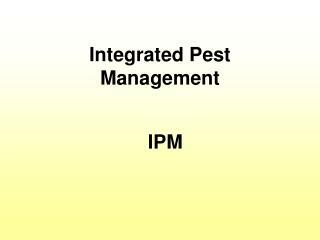 changes in agricultural policy or industrial policy that will affect production and consumption in economic sectors. Planned investments in the water sector, e.g. 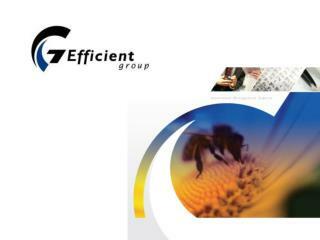 for developing water services, for restoring the natural environment/mitigating for damage caused by given water uses. 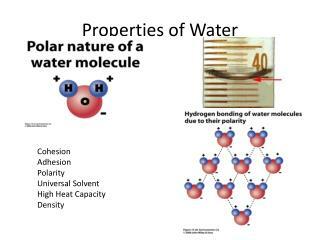 Development of new technologies likely to impact water use for industrial production and related pressures. 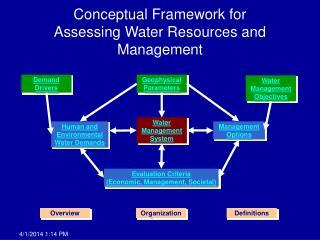 Apply appropriate methodologies to assess sector-specific water demand. Consider three possibilities of evolution of population. Consider two possibilities of evolution of demography of other cities in the region. Consider possible evolution of rural population. 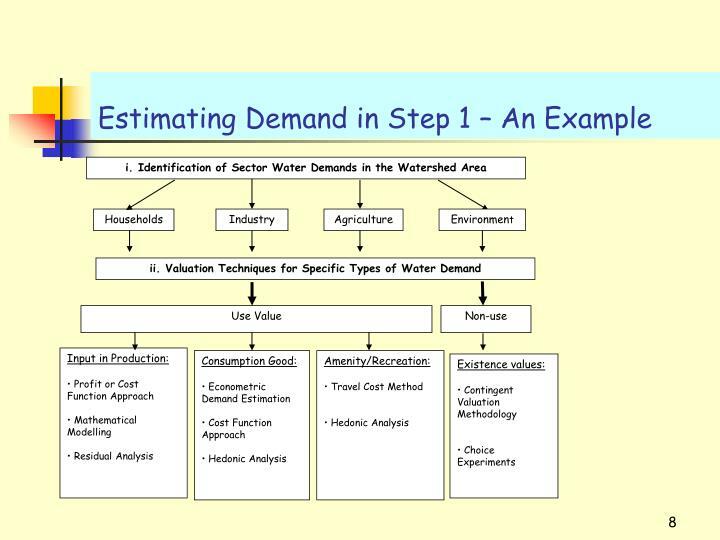 Build scenarios using basic assumptions and quantify the water balance with these assumptions. Apply step two over time. 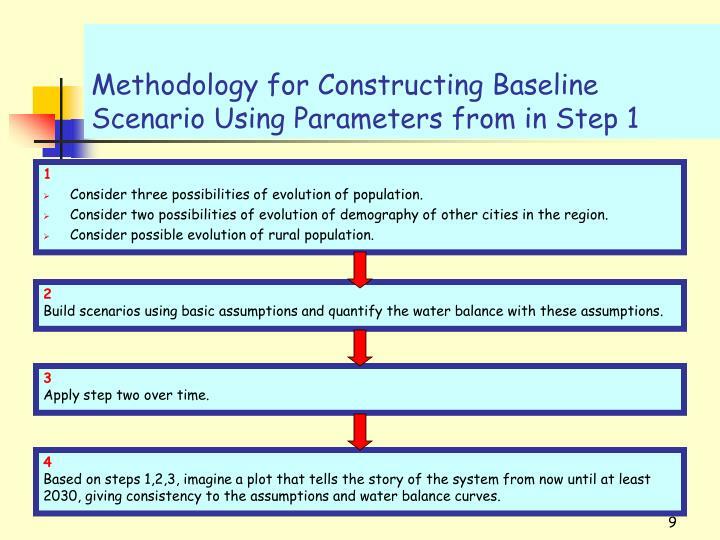 Based on steps 1,2,3, imagine a plot that tells the story of the system from now until at least 2030, giving consistency to the assumptions and water balance curves. 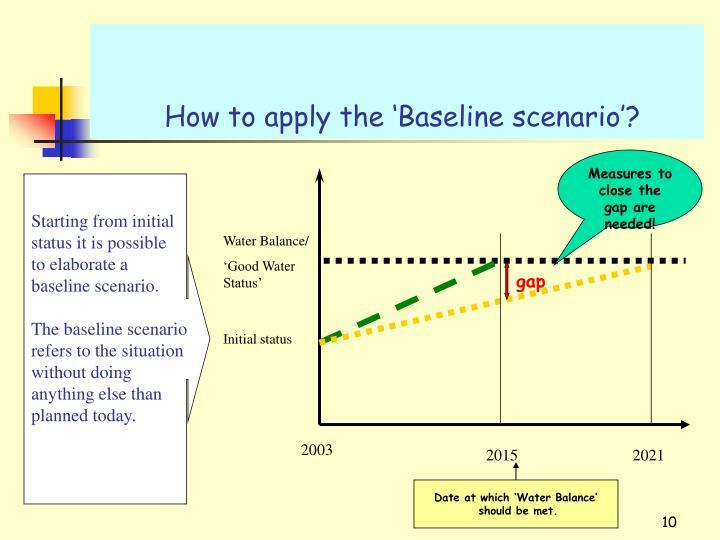 How to apply the ‘Baseline scenario’? Measures to close the gap are needed! Step2_A. How much do current water servicescost? Step2_B. Who pays these costs? Step2_C. What is the current cost-recovery level? Step2_A&B. Current cost of services Who pays for these costs? 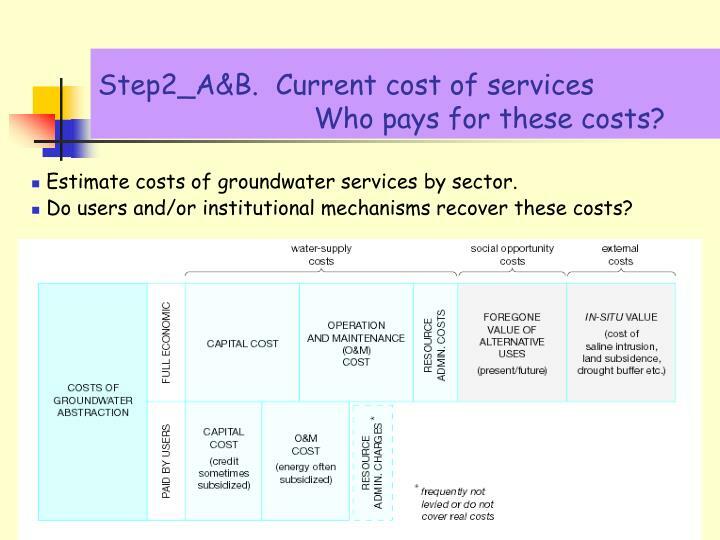 Estimate costs of groundwater services by sector. Do users and/or institutional mechanisms recover these costs? 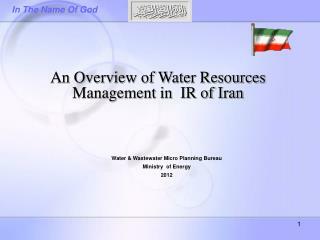 Status of key water services (e.g. number of persons connected). 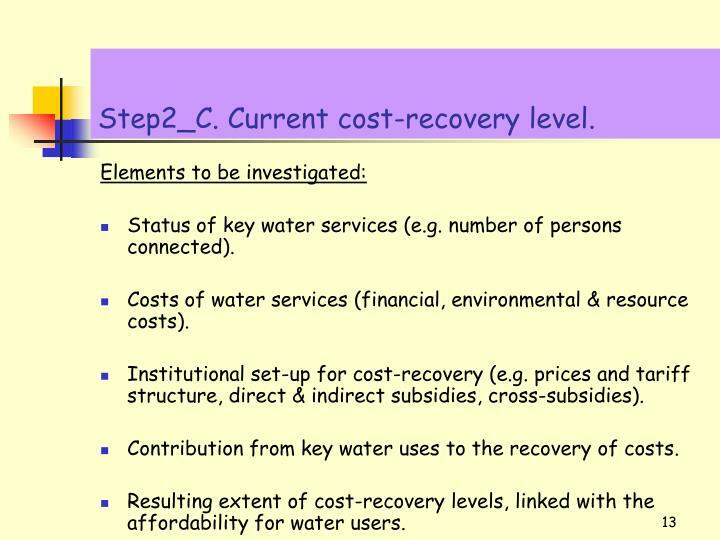 Costs of water services (financial, environmental & resource costs). Institutional set-up for cost-recovery (e.g. prices and tariff structure, direct & indirect subsidies, cross-subsidies). 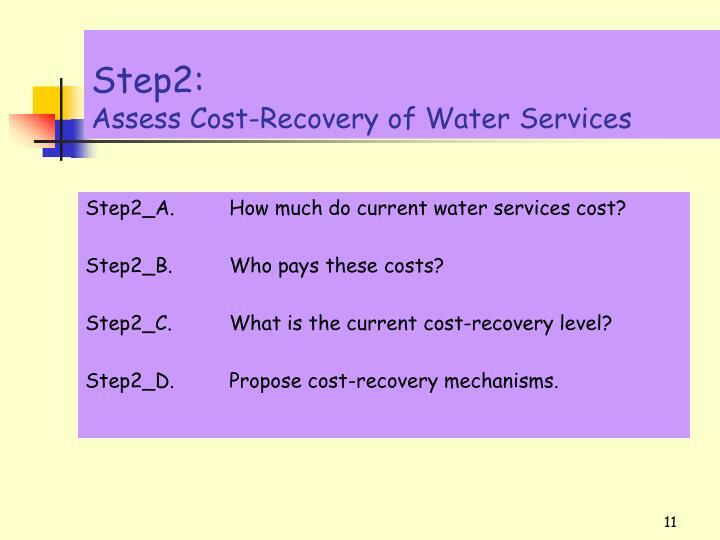 Contribution from key water uses to the recovery of costs. 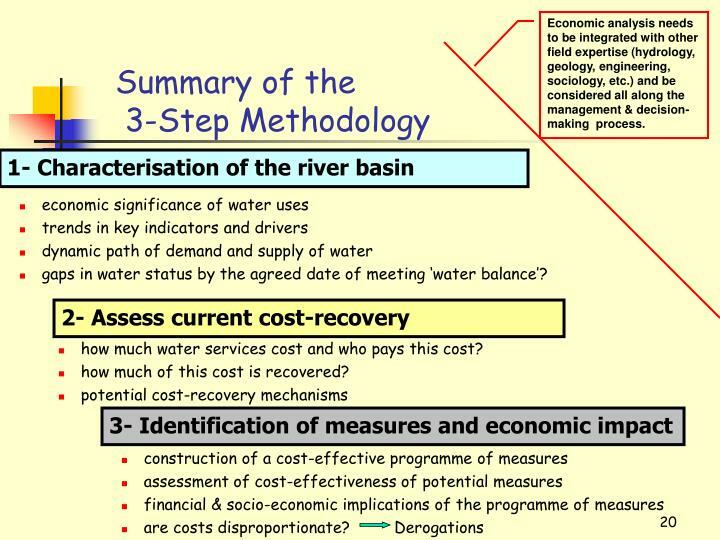 Resulting extent of cost-recovery levels, linked with the affordability for water users. Step3_D. 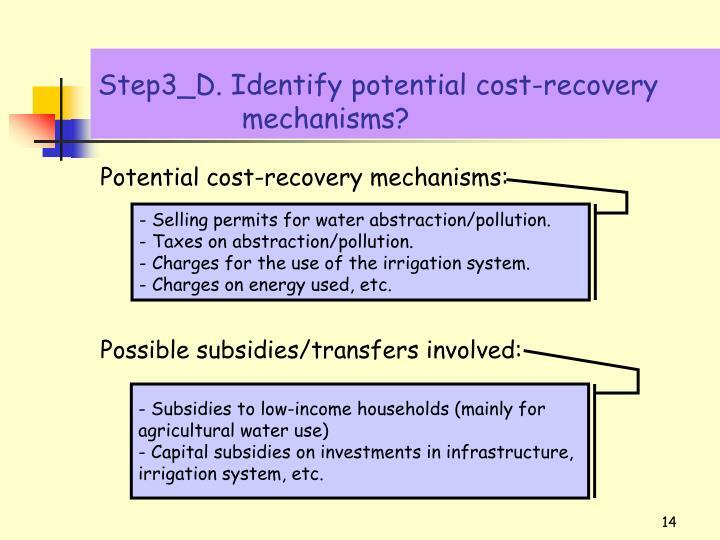 Identify potential cost-recovery mechanisms? Selling permits for water abstraction/pollution. Charges for the use of the irrigation system. Charges on energy used, etc. - Capital subsidies on investments in infrastructure, irrigation system, etc. Step3_A. 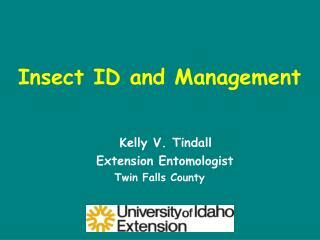 Identify least-cost set of measures. Step3_B. 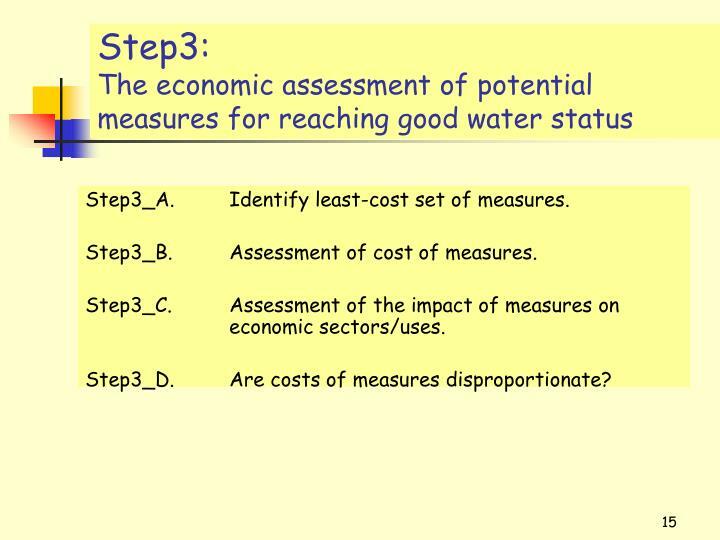 Assessment of cost of measures. Step3_C. 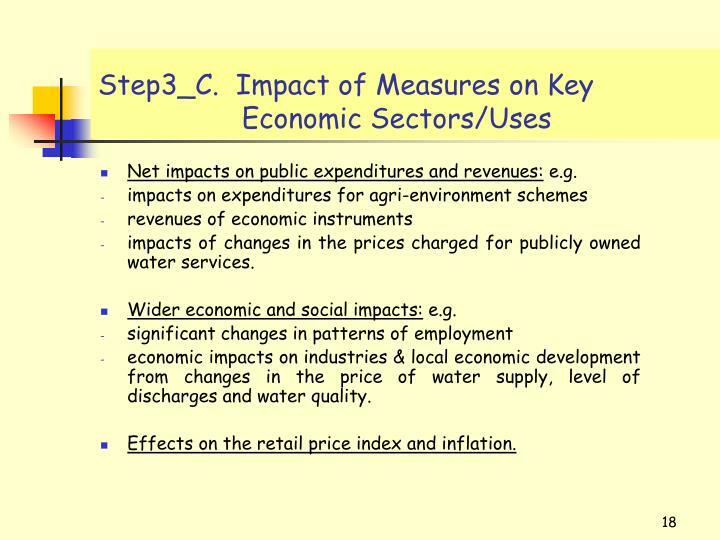 Assessment of the impact of measures on economicsectors/uses. Step3_D. 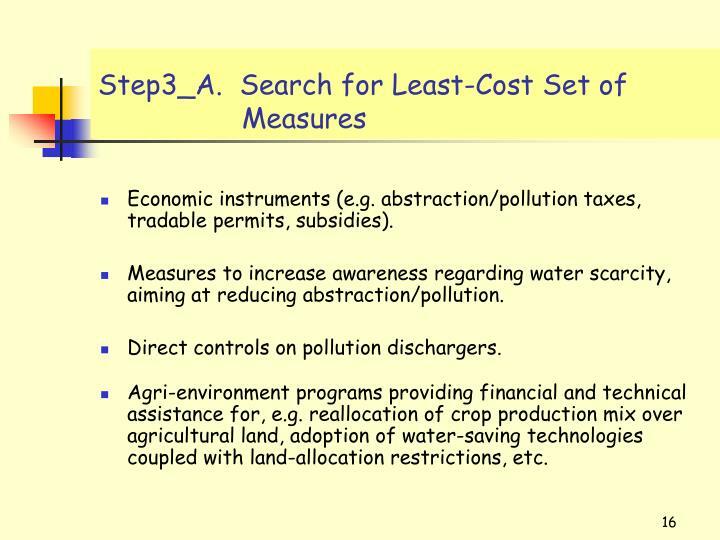 Are costs of measures disproportionate? Economic instruments (e.g. abstraction/pollution taxes, tradable permits, subsidies). Measures to increase awareness regarding water scarcity, aiming at reducing abstraction/pollution. Direct controls on pollution dischargers. 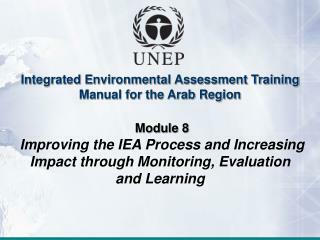 Agri-environment programs providing financial and technical assistance for, e.g. reallocation of crop production mix over agricultural land, adoption of water-saving technologies coupled with land-allocation restrictions, etc. - Estimate a range of costs along with key parameters influencing costs over time (cost change with developments in sectors). 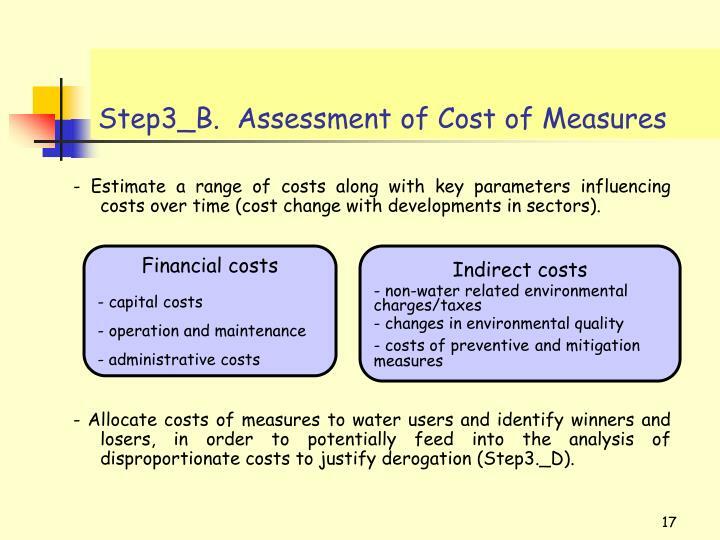 - Allocate costs of measures to water users and identify winners and losers, in order to potentially feed into the analysis of disproportionate costs to justify derogation (Step3._D). Net impacts on public expenditures and revenues: e.g. impacts of changes in the prices charged for publicly owned water services. Wider economic and social impacts: e.g. 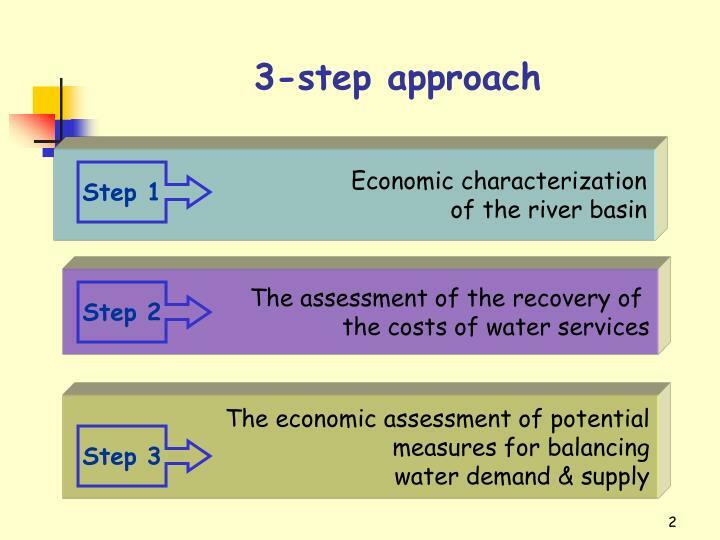 economic impacts on industries & local economic development from changes in the price of water supply, level of discharges and water quality. Effects on the retail price index and inflation. 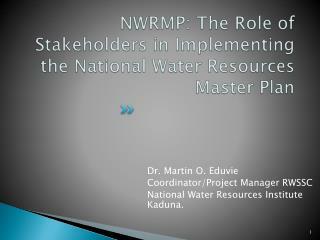 If the achievement of good water status has significant adverse effects on the wider environment & human activities. If the beneficial objectives served by the artificial or modified characteristics cannot reasonably be achieved by other means. as a result of physical alterations by human activity. !! 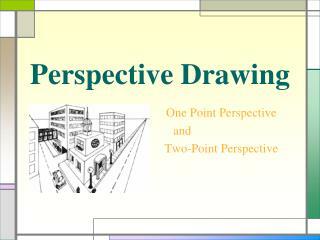 Disproportionality is a political judgment informed by economic information !! 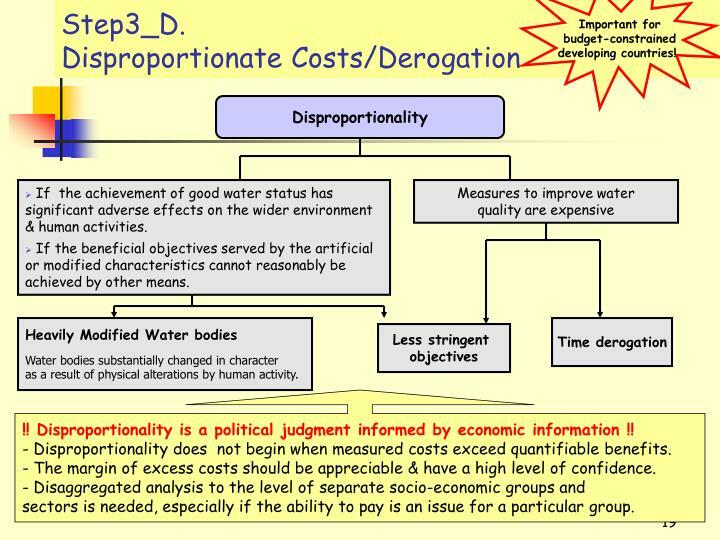 - Disproportionality does not begin when measured costs exceed quantifiable benefits. 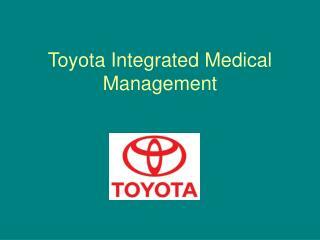 - The margin of excess costs should be appreciable & have a high level of confidence. 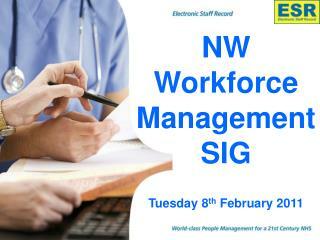 sectors is needed, especially if the ability to pay is an issue for a particular group. 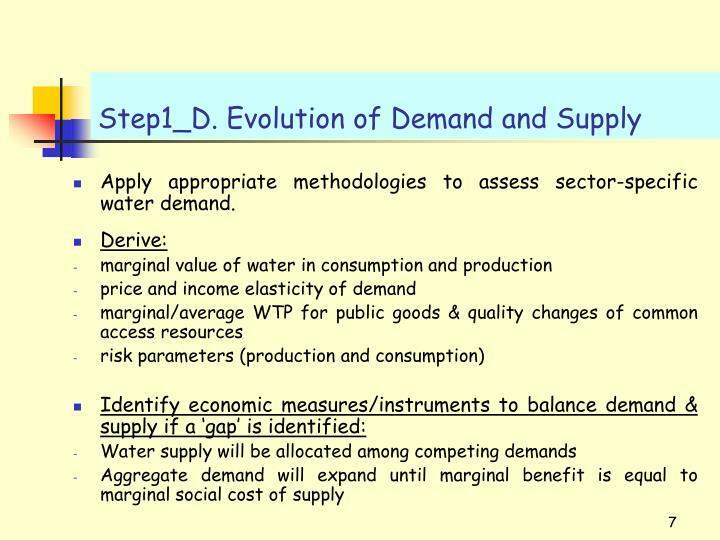 Economic analysis needs to be integrated with other field expertise (hydrology, geology, engineering, sociology, etc.) 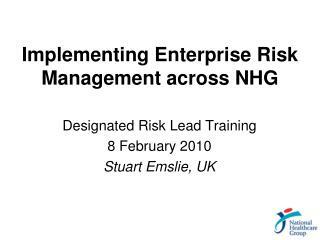 and be considered all along the management & decision-making process. gaps in water status by the agreed date of meeting ‘water balance’? how much water services cost and who pays this cost? how much of this cost is recovered? 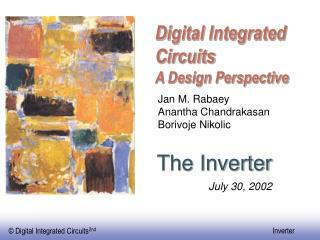 Digital Integrated Circuits A Design Perspective -. jan m. rabaey anantha chandrakasan borivoje nikolic. semiconductor memories. december 20, 2002. chapter overview. memory classification. memory architectures. the memory core. 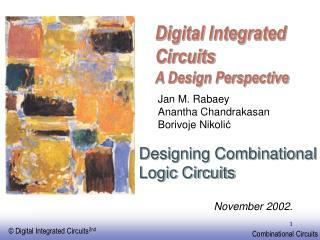 Digital Integrated Circuits A Design Perspective -. 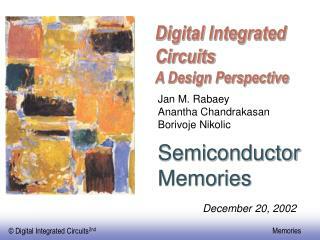 jan m. rabaey anantha chandrakasan borivoje nikoli ć. designing combinational logic circuits. november 2002. combinational vs. sequential logic. combinational. sequential. output =. (. 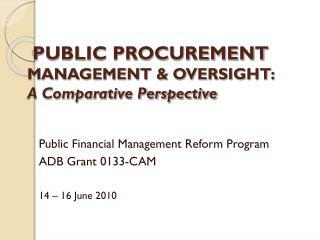 PUBLIC PROCUREMENT MANAGEMENT & OVERSIGHT: A Comparative Perspective -Public procurement management &amp; oversight: a comparative perspective. public financial management reform program adb grant 0133-cam 14 – 16 june 2010. agenda.